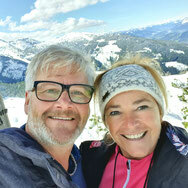 near Hauser Kaibling in the beautiful Schladming-Dachstein skiing and hiking region. on the ground floor of our private house. Right next to the guest room is the guest bathroom with toilet, shower and sink. "Small but Fine" describes the guest room BERGTRÄUME perfectly. On request we serve you breakfast in our conservatory! A fitness room with PRECOR fitness equipment is also available for you to use. The guest room BERGTRÄUME has a double bed, a mirror wardrobe, a dresser and wardrobe, a small table with 2 stools and a TV. They have free Wi-Fi! There is a kettle with instant coffee and a selection of teas. Glasses for drinks and crockery for a snack are available! The friendly room has a large window and a door to your terrace with table and chairs, where you can stay comfortable especially in the summer months and enjoy nature. From 29. May to 13. October 2019, the Schladming-Dachstein Summer Card is included! Your bathroom is located next to the guest room. here you can also store your suitcases, skis and ski boots! Free parking for 1 car is available. 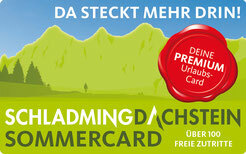 free with the Schladming Dachstein Summer Card!